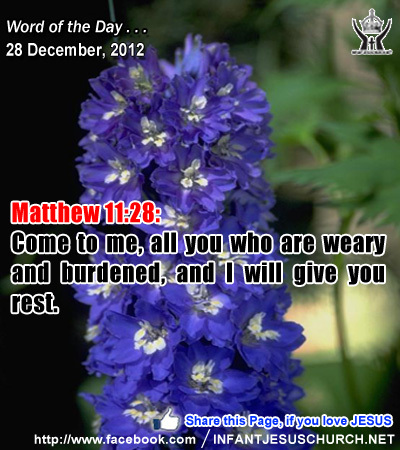 Matthew 11:28: "Come to me, all you who are weary and burdened, and I will give you rest." Heavenly Father, teach us, O God, to learn to rest in your grace and providence more and worry less. We want to submit our burdens to Jesus and let him teach us his way and how to find his rest. Sometimes we are so tired and weary we don't think we can continue, so please, dear Father, let us find rest in Jesus. In Infant Jesus name we offer this prayer. Amen. 13Now when they had departed, behold, an angel of the Lord appeared to Joseph in a dream and said, "Rise, take the child and his mother, and flee to Egypt, and remain there till I tell you; for Herod is about to search for the child, to destroy him." 14And he rose and took the child and his mother by night, and departed to Egypt, 15and remained there until the death of Herod. This was to fulfil what the Lord had spoken by the prophet, "Out of Egypt have I called my son." 16Then Herod, when he saw that he had been tricked by the wise men, was in a furious rage, and he sent and killed all the male children in Bethlehem and in all that region who were two years old or under, according to the time which he had ascertained from the wise men. 17Then was fulfilled what was spoken by the prophet Jeremiah: 18"A voice was heard in Ramah, wailing and loud lamentation, Rachel weeping for her children; she refused to be consoled, because they were no more." Suffering takes different forms: illness, sickness, handicap, physical pain and emotional trauma, slander, abuse, poverty, and inequality. Jesus exclaimed that those who cry, who are hated and persecuted for virtue sake are blessed. The word blessed exactly it means happiness or beatitude. It describes a type of joy which is tranquil and untouchable, self-contained and independent from chance and varying circumstances of life. There is a certain contradiction for those blessed by the Lord. Mary was given the sanctity of being the mother of the Son of God. That sanctity also would become a sword which stabbed her heart as her Son died upon the cross. She received equally a crown of joy and a cross of sorrow. But her joy was not reduced by her sorrow because it was fueled by her faith, hope, and belief in God and his promises. Jesus promised his disciples that no one will take your happiness from you. The Lord gives us a supernatural happiness which enables us to bear any sorrow or pain and which neither life nor death can take way. Do we know the joy of a life fully submit to God with faith and trust? Loving Jesus, you gave your life for our sake, to save us from slavery to sin and death. Help us to take our cross with joy that we may readily do your will and not shrink back out of fear or cowardice when trouble besets us.